Did the downturn start before the crash? I’m told (though I’ve no intention of putting it to the test) that if you spend an evening drinking alcohol free beer, you still get a hangover. Apparently, when they make alcohol free beer, the stuff which makes you merry the night before is taken out, while the stuff that makes you feel rotten the morning after is left in. Giles Wilkes reckons something similar happened to Britain in the 2000s. A legend has grown up that the decade was a big party in which the economy grew and we all splurged, spending money with gay abandon and racking up lots of debt. 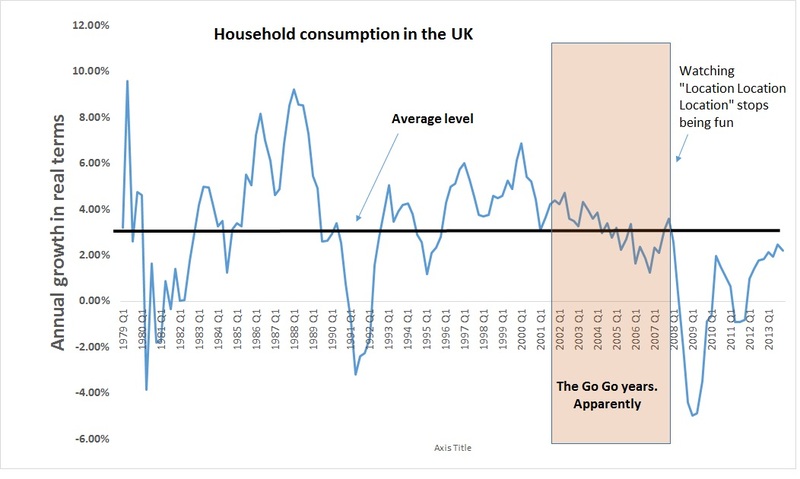 In fact, household consumption fell, which suggests that many of us weren’t having a party at all. We didn’t enjoy a binge but we still got the hangover afterwards. The 2000s were the Kaliber decade. You can see what a real boom looks like: 1985-1989. That was going some. But as for the years running up to 2007, for many these were tough times. 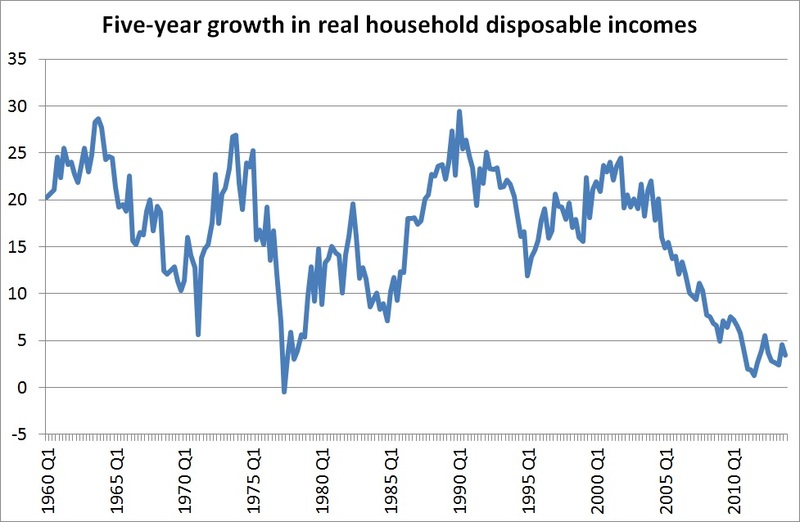 Chris Dillow reckons one reason for this was that disposable income growth was slowing down before the recession. The slowdown in income growth’ he says, indicates a weakness in the economy that was there well before the recession. This pattern is consistent with the “investment dearth” of which Ben Bernanke spoke in 2005; Robert Gordon’s “end of growth” (pdf); Larry Summers’ secular stagnation and Andrew Kliman’s falling rate of profit. It’s this growth slowdown that led to the financial crisis. A lack of real investment opportunities meant that low interest rates fuelled what Austrians call malinvestments and Marxists “speculation and crises”: mortgage derivatives grew in large part because there was a hunt for yield as bond yields declined. Stagnation generates bubbles, and bubbles burst. There are a number of examples of this; things that we associate with the recession but which actually started before the financial crash. The median wage, for example, began to falter sometime around the middle of the decade. The rise in the number of working poor also pre-dates the recession. 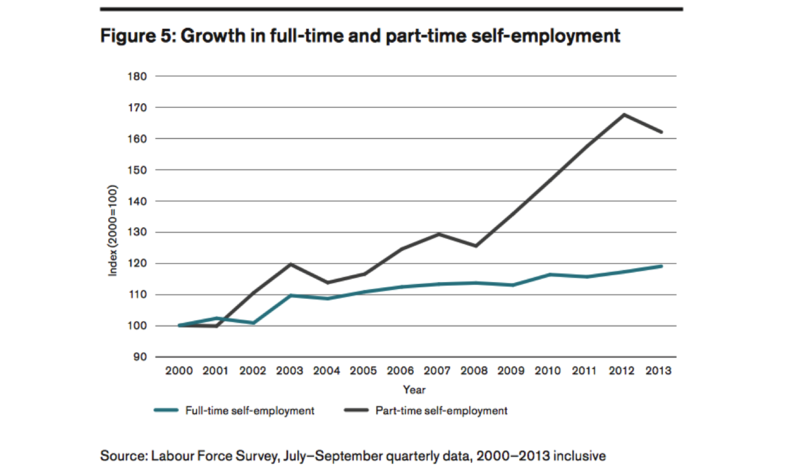 So too does the increase in self-employment and, especially, the rise in part-time self-employment. 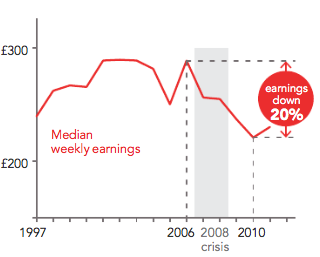 The corresponding fall in self-employment earnings also started before 2008. 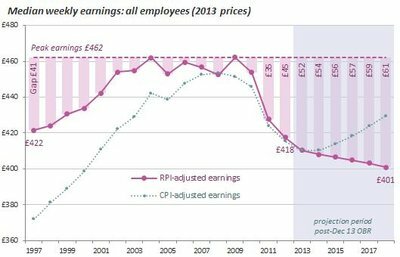 Self-employed incomes flatlined from the start of the decade, were already falling by the time the recession hit and then crashed spectacularly from 2008. Source: Resolution Foundation based on Labour Force Survey. 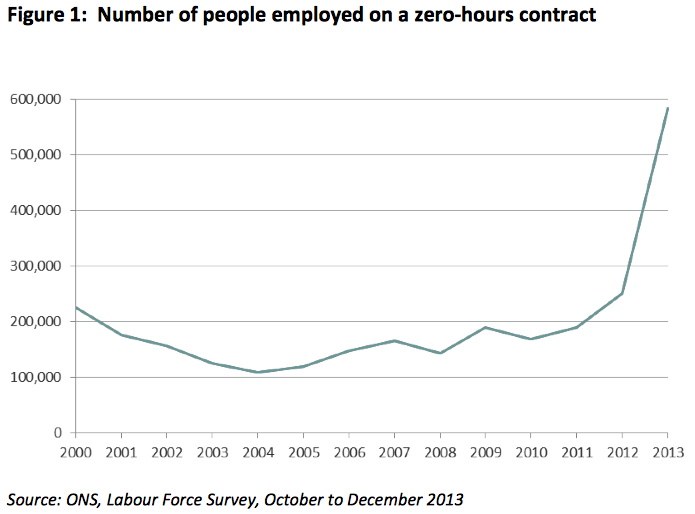 The number of people describing themselves as involuntarily in part-time work was creeping up before the recession too. According to Morgan Stanley, the amount of cash transactions in the economy began to rise in the early 2000s, after falling during the previous decade. This suggests an increase in the numb of cash transactions and, probably, in the size of the grey economy. There was a sharp rise after the recession but the cash economy had been growing for some years before. Income stagnation, lower household spending, the cash economy, rising working poverty and an increase in precarious forms of employment are all trends that pre-date the recession. In some respects, then, the downturn started before the crash. 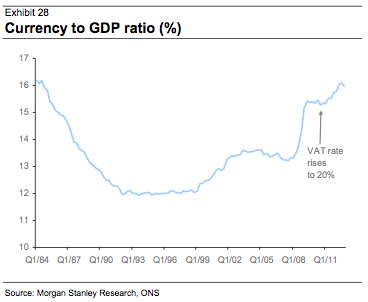 Some of the things we think of as symptoms of the recession were happening while GDP was still growing. It is therefore reasonable to assume that some of these trends will continue even as the economy grows again. Self-employment is still rising. Projections by the Resolution Foundation suggest that incomes will not return to their pre-recession level until 2018. Likewise, the benefits bill is not expected to fall much before the end of the decade. By this time, according to the OBR, what passes for the post-recession boom will be over. As Chris says, politics doesn’t help us much here. The Coalition parties blame Labour for borrowing too much. Labour blames the government for cutting too fast and stifling growth. There’s a grain of truth in both arguments but they are a long way from the whole picture. While most of us weren’t looking, our economy and labour market were changing. The recession gave us a reason to keep on not looking. The recession poured kerosene on a fire that was already smouldering. At least some of the features we associate with the downturn were already there before it started. Could it be that the Peak Jobbers are right? Are countries like the UK now struggling to create enough well-paid jobs, even during periods of economic growth? If so, under employment, in-work benefits, low-income growth and precarious forms of employment may be a feature of our economy for some time yet. Update: Since I posted this a couple of people have pointed out some other ‘recession features’ which started before the recession. 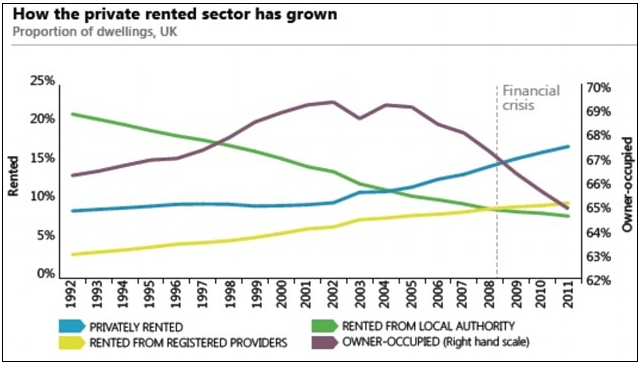 The fall in owner-occupancy and its corollary, an increase in private rented accommodation, started before the downturn too. Update 2: The turbo-blogging Giles now has another post on this theme: When did the Great Recession start? 6 Responses to Did the downturn start before the crash? Excellent post – many interesting points. I remember reading about cracks appearing in the mortgaged backed securities market at least as early as December 2006 (see this article from The Economist http://www.economist.com/node/8424086) and again in March http://www.economist.com/node/8885853 and November 2007 http://www.economist.com/node/10167658. The American Enterprise Institute seems to have predicted this would happen in 1999 http://businesswritersltd.wordpress.com/2014/03/11/did-the-american-enterprise-institute-aei-predict-the-2008-crash-in-1999/. And it all had ominous echoes of September 1998 http://www.economist.com/node/166416. Also worth remembering that we had already seen a lot of malinvestment in the late 90s dot.com boom that hadn’t really been worked out of the system. The Greenspan put rushed to the ‘rescue’ when markets tanked in 2001, which only served to store up more trouble for later. As a result, such malinvestment continued after the crash, as this report about the state of the commercial property market in May 2003 makes clear: http://www.economist.com/node/1794945. Blaming people splurging seems just passing the buck. If you offer cheap loans and mortgages with few/no questions asked people will of course gorge on the feast. So back in 2001 there was an expensive war to pay for, the dotcom bubble had burst, offshoring had been going full steam for years – so finance and housing were the only games in town and governments needed the tax income. 2001 – apart from 9/11 and the subsequent big spend. Perhaps a desperate need for a lot of money to fund an ever increasing war and keep the domestic economy afloat started the rot. Perhaps the regulators tried the brakes but were countermanded – remember Bush and Blair were at the helm. Surely the regulators could see trouble coming but who better to blame when the crash came and the taxpayer foots the bill – foolish people splurging. The truly guilty seem to have have escaped. Meanwhile peak jobs may be here, which begs the question – can Western governments afford war any more – at least within a civilian economy? One factor not mentioned is the effect of immigration during this period. Even in my small business, we took on several Poles to do highly skilled work that we’d been unable to find willing Brits to undertake (or even train up) for about two years prior to Poland’s accession to the EU. The considerable increase in the supply of ready-to-work skilled labour must have placed a brake on disposable incomes long before the bankers’ party came to an end and Mr. Brown saved the world. New car sales peaked in 2003 at 2.6 million and were falling already when the recession hit.